Customers have been flooding into Blighty's Tuck Store for the past few days buying McVities Rich Tea biscuits and Cadbury Bournville chocolate. Why? 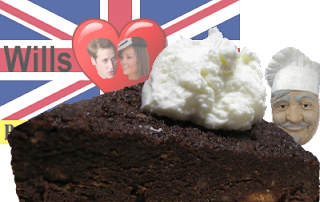 Because a Toronto newspaper published a recipe for a chocolate biscuit cake that is, apparently, a firm favourite of Prince William. Judging by the quantity of Rich Tea biscuits we have sold, Prince William's favourite cake is being made in many households this week. Of course, I had to give it a try myself; here is how I made it. Eat the leftover biscuit; go ahead, be weak, they are good! Sorry Wills, I am a diabetic and my doctor has told me to lose weight so I skipped the chocolate topping. I whipped up some cream and served my cake with a spoonful of cream instead. By the way, I used the remainder of the cream that I bought for next week's sumptuous recipe (sorry doc, I have will have to lose weight later). If you want to make Prince William's cake the way the prince likes it, and you don't have to worry about your diet, then go ahead, go the whole hog. By the way, the prince has a very good taste in cakes.